He is president and founder of Small Business Network, Inc., a media company dedicated to serving small business. He conducts over 1,000 live interviews annually with his Brain Trust, the world’s largest community of small business experts. Jim reaches a national radio audience, plus worldwide listeners on his Internet simulcast and archives. Jim is a syndicated columnist and the author of two books, Small Business Is Like a Bunch of Bananas and Three Minutes to Success, which have sold over 90,000 copies combined. Jim also authors the Ask Jim® column for Entrepreneur’s Startup magazine and contributes to many other publications on small business and entrepreneurship. 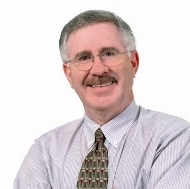 Jim is the creator of the unique small business knowledgebase, AskJim.biz®. The U.S. Small Business Administration recognized Jim as the 2002 Small Business Journalist of the Year. He is a member of the SBA’s National Advisory Council. Fortune Small Business magazine identified Jim as one of the 30 most influential people in America representing small business interests. Jim leverages his multi-year relationships with organizations and communities that support small businesses to help corporations build their own mutually beneficial relationships with these groups to accomplish a common objective: Reaching and supporting small businesses.